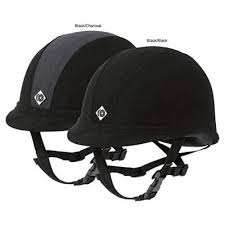 Designed to flatter, the Charles Owen JR8 Helmet** transitions beautifully from schooling to the show ring. It's low profile design and gently rounded brim frames your face, while a weather-resistant microfiber suede cover resists marks and scuffs to stay looking fresh. A hard, technically-designed outer shell is paired with a liner made of high-grade polystyrene designed to absorb impact. A black nylon harness completes the finished look and offers strength and security. This helmet is accented with a metallic logo above the peak and an embroidered logo patch at the back. **ASTM F1163-04a/SEI certified.